Israel's 60th anniversary commenced Wednesday evening with a formal torch-lighting ceremony on Mount Herzl in Jerusalem. The celebrations were held under tight security, due to warnings received on terror organizations' plans to carry out attacks. Knesset Speaker Dalia Itzik said during the ceremony, "The nation of Israel will never be able to pay off its debt to its fallen soldiers. "The State of Israel is an extraordinary success story; a wonder by any historical measure," she said. "We built this magnificent enterprise with our own hands. There are countries that are wealthier and certainly more peaceful, but there is no other country like the State of Israel. There are flaws and we still have things to do, but behind these flaws is a great country." Addressing the Palestinian terror organizations, Itzik said, "As long as Israel has one Asher Tuito (eight-year-old boy who was seriously wounded in a Qassam attack on Sderot) – you do not stand a chance. We want peace not only for our children but for yours as well; however, you must realize that we will know how to fight if needed." Ralph Goldman, 93, honorary executive president of The American Jewish Joint Distribution Committee. He lit the torch with Shmuel Falik, 13, of Miami, who was born on Independence Day. Galila Ron-Feder-Amit, one of Israel's most prominent and renowned children's book authors, a foster mother of children from broken homes and a volunteer helping underprivileged kids. She lit the torch with Ronni Ackerman, 13, an actress in The Orna Porat Theater for Children and Youth. Ronny Douek, a businessman who has been working for 20 years now as a social entrepreneur for the welfare of children and youth. He lit the torch with Pnina Nivetzag, 18.5, a graduate of the Aharai! ("Follow me!") youth movement. Dr. Erika Landau, who has been working for 40 years now to educate generations of gifted and talented children to lead in all areas of life. She lit the torch with Zurarish Weba, 18, who is about to join the IDF and is active among youths who immigrated to Israel from Ethiopia. Dr. Yitzhak Kadman, CEO of the National Council for the Child, which engages in a variety of activities for the sake of Israel's children. He lit the torch with eight-year-old Niv Caspi, a resident of Kibbutz Kerem Shalom near the Gaza Strip. Rabbi Yitzhak David Grossman, founder of the Migdal Ohr education network, which is active in the fields of education, welfare, aiding children at risk, immigrant absorption and bringing people closer together. He lit the torch with Tamir Abukasis, 13.5, an eight-grader at the Bnei Akiva yeshiva, who escaped a Qassam rocket attack in Sderot but lost his sister Ella who protected him with her body. Uri Jakobovitch, an agriculturist at the Sdeh Bar farm for youth at risk, where he arrived about four and a half years ago in the footsteps of his older brothers. He lit the torch with Reuven Bentolila, 17, who immigrated to Israel from France in 1999 and was evacuated from Gush Katif as part of the 2005 disengagement plan. Sana Elbaz, the daughter of a Bedouin family from Tel Sheva and the head of the first of its kind daycare center in the Bedouin sector, who had led a revolutionary educational program and brought about changes in the Bedouin society. She lit the torch with Fahoum Fahoum, 16.5, a Muslim 11th grader, who takes an active part in efforts for coexistence between Jews and Arabs. He is considered an outstanding tennis player and a member of Israel's youth delegation. Hadara Rosenblum, head of the Education Ministry's student council unit, who has invested great efforts in cultivating youth in the different forums she has established, including Seeds of Peace and Young Ambassadors. She lit the torch along with Genia Grishkov, 8.5, a young and talented violinist, who takes part in the unique music project of the school for young violinists in Migdal. Naftali Deri, secretary-general of the Youth Movement Council. He lit the torch with Yael Barzilai, 16.5, head of a youth movement in Hod Hasharon aiding brain-damaged children. Prof. Pnina Klein of Bar-Ilan University who works in Third World Countries on behalf of the United Nations Children's Fund (UNICEF). She lit the torch with Oren Almog, 13, a ninth grader who lost his eyesight four years ago in a terror attack in Haifa which left four of his family members dead, including his father and younger brother. Major Avihai Hayun, an Israel Defense Forces officer, who as part of the Navy training center is in charge of cultivating special populations and the Givat Ada Children's Home. He lit the last torch with 17-year-old Salman Nabuani, the brother of Staff Sergeant Tamir Nabuani, the first Druze fighter to join the elite Sayeret Matkal commando unit, who died during a navigation in the Negev on January 1, 2008. 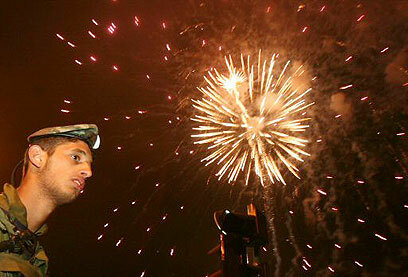 A spectacular laser, music and light show that began at 10:30 pm Wednesday adorned Israel’s skies . Residents of Beersheba, Eilat, Haifa, Netanya, Tiberias, Tel Aviv, Jerusalem and Ashdod were all be able to enjoy and marvel at this brilliant spectacle. The celebrations will continue Thursday with an impressive Israel Air Force air show and fly-by across Israel’s skies between 12:30-2 pm. A huge paratrooper demonstration will also take place, as well as a naval review by the Israel Sea Corps which will begin in Haifa at 9 am and end in Ashkelon at around 2 pm. 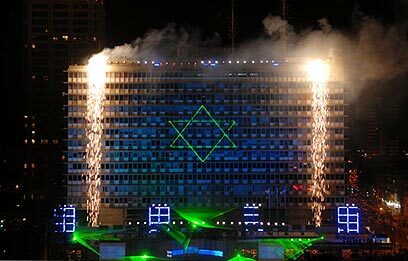 According to figures released by the Central Bureau of Statistics on the eve of Independence Day, 7,282,000 people live in Israel today. About 75.5% of them are Jews, some 1,461,000 are Arabs, and 322,000 are defined as "others". According to forecasts, Israel's population will include some 10 million people in the year 2030. See all talkbacks "State of Israel turns 60 "